Recently for my birthday, my daughter Althia surprised me with the most amazing gift—a framed Phoenix Gazette feature article dated May 7, 1937, titled “New Generation of American Pioneers Treks Westward, Fleeing ‘Dust Bowl’ And Seeking New Place to Make Homes.” The Gazette was one of Arizona’s top newspapers in the 1930s, and the story was an interview between a reporter and my grandparents, mother, cousins, and numerous other families who were parked alongside the road seeking shelter for their caravan under the trees, having been forced from their Oklahoma farms to pick fruit for survival. One of the original editions of the newspaper article had been in my grandfather’s possession since it was originally published, kept in a small wooden box near his recliner while I was growing up, then inherited by me on his passing. I had cherished that clipping as well as the other items in the little chest—war stamps from World War II, a small screwdriver-like tool, old work permits, and so on—until those heirlooms burned in my home in 2011. Thankfully, I had always remembered the date on which the original story had been published, because on the reverse side of the feature about Grandpa and Grandma was the historic report, “Zeppelin Explodes,” all about the German passenger airship Hindenburg that had caught fire the day before, May 6, 1937, killing thirty-six people when it blew up while attempting to dock with its mooring mast at Naval Air Station Lakehurst in Manchester Township, New Jersey. Before news had spread around the world about the Hindenburg, the top story interest the Gazette reporter had been assigned involved my family’s Great Depression survivors trekking through Arizona on their way to the promised land—sunny California, with its sprawling fruit orchards and miles of row crops where work was waiting for desperate manual laborers. There is a reason they call it the “Roaring Twenties.” World War I had just ended, wartime economy transitioned to peacetime economy, consumerism surged, industrial production boomed, and the United States had just become the wealthiest country in the world. For the first time, more Americans were living within the new bright lights and big cities than in farmlands. Technology in the cinematic arena whispered of an all-new and unprecedented “speaking film” on the silver screen’s horizon, while entertainment via live stage saw raised hemlines sweeping provocative fringe across the bare knees of flapper girls. Slow and conservative dances were largely replaced by the rapid Fox Trot, Charleston, Texas Tommy, and Brazilian Samba. Electronics including radios, refrigerators, and vacuum cleaners were implemented in almost every household. Horses and wagons were abandoned in the interest of the innovative automobile. Everywhere one looked within city borders, glasses were raised to celebrate economic success; laughter echoed through dance halls above the din of merriment; grace notes poured through brass instruments and bounced off the walls in jazz parlors; fast-paced piano pieces tickled the consciousness of patrons, inspiring them to order desserts following their seven-course meals; clouds of “harmless” cigarette smoke hazed around chandeliers in fancy food and drink establishments; and businessmen dangled pretty ladies from their arms as they wrestled their peers for the privilege to pay the evening tabs. The people had been engaging in a gaudy spree in a country that never sleeps. There were, of course, contributors to the economic downfall that haunted the U.S. throughout the Great Depression other than the stock market crash on Wall Street, but the crash has largely been attributed by economists as the central, or at least most visible, cause. Prior to the Roaring Twenties, many bankers of Wall Street had reserved their business deals for the elite class, most often other bankers. But as the general public showed a sharp increase in the interest of purchasing personal security through the liberty bonds during the war (promoted by celebrities such as Charlie Chaplin), an investment mind frame took the nation by storm. It was no longer only the elite who partook in such ventures, and banks were profiting from deals with the middle class. National City Bank President Charles Mitchell saw this opportunity to market corporate bonds and common stocks to everyone within the general population. If the people were so willing to buffer the government’s capital funds via liberty bonds, they would be even more excited about the prospects of investing in their own security through prosperous industry that promised to benefit them further with extravagant new technology to match their increasingly extravagant culture. By Mitchell’s command, brokerage offices were launched all over the U.S. Before long, stocks and bonds had grown to staggering heights, and many jumped on the bandwagon of gold while the market was thriving. Financial investors had given their every cent to what appeared to be respectable and safe speculations…but their investment focus was on price movements and temporal inflation instead of the wiser fundamental values of long-term security outside stocks. Some saved their money in the bank as it came in spades through the stock market, and others bought businesses as well. However, because of how the inbound crash would affect the banks as well as the consumers, these endeavors were of marginal importance for many. It seems like nobody saw the risk for what it was. Hordes of stockholders flocked to moneylenders, banks, and brokerage firms; so great was their confidence in the bull market that they borrowed well beyond their means in order to speculate, and the more demand there was for shares as a result of this investing culture, the higher the prices became for shares. Only 10 percent was required to put down for margin on stock, so one thousand dollars cash-in-hand represented ten thousand dollars in stock. How easy it was for a man or woman to turn a couple of dollars into a couple hundred dollars within only a couple of weeks. Industry, factories, manufacturers, technology, and companies that stood as major pioneers of invention all benefitted from the heaps of financial support the infrastructure of the market was building; bankers and individuals all profited from the interest earned on payday. Everybody was winning! When the money rolled in, it was thrown straight back into stocks and bonds for a speedy turnaround…that is, when it wasn’t being spent on seven-course meals, hats, scarves, purses, gold cuff links, automobiles, electronics, and lavish homes with outrageous mortgages. Money was being “made” in record time and for people of all social circles, and they were living large, believing that this new, lucrative way of life would last forever. And nobody could blame them for thinking in such a way when even the pros, such as the illustrious Yale economist Irving Fisher, famously predicted that the stock market had arrived at “a permanently high plateau.”[ii] The president of the United States, Herbert Hoover, even said, “We in America today are nearer to the final triumph over poverty than ever before in the history of any land.”[iii] (Hoover’s comment was a statement that would haunt him later on and for the rest of his presidency until he was voted out of office by a landslide during the next election after having become the people’s scapegoat for the Great Depression.) Yet with all of this “moneymaking,” a great number of the American population appeared to owe more than they owned when it came to actual cash. In addition to the practice of living off of, spending, and reinvesting borrowed monies, behind the scenes, mastermind investors began taking advantage of the unaware public with insider trading. They personally promoted and invested in stocks that they had nonpublic information about, essentially shepherding the people to trail just behind them and put their funds into puffed-up stocks. These inside traders would pull their earnings and get out at the most strategic moment (again, based on nonpublic information), leaving all who had followed them to inherit the losses, and they would prevail with the optimal earnings over and over again…and the debt of the people—as well as the empty promises of a glorious payday—grew even more overwhelming through market manipulation. Some warned that these gratuitous speculations from a naïve people would lead to incredible economic depression, but despite these warnings, ultimately, the nation’s unquenchable thirst for riches resulted in more loans for more eventually empty stocks. On Wednesday, October 23, 1929, after a hasty and overnight loss of confidence in the system (nobody is entirely sure why this happened with such veracity and so abruptly on one single day, and the causes of the swift shift in confidence remains highly debated, but it’s likely that it occurred as a result of Americans observing the London Stock Exchange crash just prior), share prices plunged on the New York Stock Exchange when the buyers suddenly became the sellers. The next day, Thursday, October 24, now referred to as “Black Thursday,” the trading floors were crawling with people; everyone wanted out of their stocks, but nobody was investing. Documentation of that day reveals that the crowds were so stunned and terrified by the sudden fluctuation that as updates were being read to the thousands and soon tens of thousands making up the masses outside the Exchange building, gasps, cries of anguish, and even fainting erupted. Widespread panic swept the states from border to border all across the country. Notable bankers (including Charles Mitchell) raced to the trading floor and loudly and proudly poured millions of dollars into U.S. steel stocks in front of onlookers in hopes of rejuvenating the faith of the traders. It worked, but only temporarily. Over the weekend, the stock market continued on as usual, but an increasing trepidation and feeling of foreboding left Americans unsettled. By “Black Monday,” October 28, those who had been involved in market manipulation (as well as those who saw the proverbial writing on the wall) saw their open door to get out while they could, and they did so, dropping the Dow Jones Industrial Average by 13 percent by the end of business. On “Black Tuesday,” October 29, 1929, the most devastating stock market crash in the history of the country instantly brought a shocking silence upon the Roaring Twenties. In the same national alarm that had marked the previous Thursday, everyone wanted out, and there was nobody left investing. By the end of business, the market had lost $14 billion. Banks were inundated with multitudes of frightened responders. From everywhere all at once, bank accounts were emptied and cash stored elsewhere while the banks still had anything to give. In no time at all, bank reserves were tapped dry, the crowds were denied their own savings, and banks across the country locked their doors, many of which never reopened. Cries—both angry and forlorn—lifted up from the city streets, an impromptu chorus of chaos and upheaval. Millions of Americans instantly went from “rich” to destitute as the debt collectors came to take what was owed them. People lost every material possession they owned. Poverty, homelessness, and depression immediately became the financial plague that would wrack the states for years to come. Emigration to other countries soared to record numbers, involving both the return of immigrants back to their home countries, and native U.S. citizens’ decision to start fresh on foreign soil in Canada, Australia, or anywhere they could bargain for passage to. Construction was halted midway through the raising of new businesses and homes that had been visualized by dreamers only weeks before. Photos still circulate of these “homes,” and in some cases they show destroyed furniture and disassembled large instruments (such as pianos) being used as walls. Although some shacks or tents featured a coal stove that had been stripped from their homes, many were left without heat in the fatal cold. Young children starved as their mothers waited entire days in line at soup kitchens for only a small tear of bread. Often, residents of the Hooverville shanties would hang signs around their doors, and in some cases on their person, advertising their skills and looking for work; the payment they required was frequently only a meal or two they could bring home to their wives and children, although some biographical accounts tell of those who would literally work for anything, such as baby blankets or used shoes. Mothers and fathers slept on the damp ground or molded mattresses while children huddled together on stacks of cardboard. Relief was needed everywhere, all across the United States, but it was seldom found. Around twenty thousand now-homeless army veterans had been promised a bonus for their service in WWI, but the sum was not due to be paid until the year 1945. (Violent riots between these veterans, referred to as the “Bonus Army,” and law enforcement ensued just outside the White House during the summer of 1932, causing President Hoover to barricade himself within.) With nothing solid keeping them in one place, and no possessions to haul, stock market crash victims swiftly became travelers to neighboring cities and states to look for shelter or food. And just when it seemed it couldn’t get any worse, it did. Farmers wore handkerchiefs over their faces, tried to breathe through the black winds, and spit up mud balls by the end of the work day. Women and children holed up in their homes and nailed the windows shut, but it helped little against the seemingly never-ending layer of black that settled upon their countertops and furniture, in their beds, in the threads of their clothing, all over their bodies, and within their lungs. Later, many went on to document what it felt like to exit their homes and observe giant walls or “black blizzards” of dust, like tornadoes, flying toward their land. With their harvest destroyed as well as their farming equipment and sometimes their homes (after the more aggressive of these storms, many homes had to be torn down), farmers also became travelers, with tens of thousands of families uprooting their lives to look for a fresh start elsewhere, most often to California. (By 1935, over five hundred thousand American farm civilians had become homeless.) Sadly, they discovered that the economic downfall of the nation left little for them to turn to in the cities. Although some depictions of the Dust Bowl migration have been exaggerated for the sake of dramatic, Hollywood, and media storytelling (and there are those historians who even suggest the celebrated Grapes of Wrath retelling challenges the truth at times by reporting the worst symptoms of migration and failing to mention families who achieved new beginnings without tragic death, starvation, or loss), many cultural issues arose during this time that completely destroyed the lives and legacies that had been built over generations. Men, women, and children packed only their most precious sentimental heirlooms and, with little more than the clothing on their back, headed out in “jalopies” (old, worn-out cars), rope wrapped around the exterior from every angle to carry basic survival materials. Most had nowhere to go as they drove aimlessly toward the unknown to look for work; staying with relatives was often out of the question, since entire extended families—and their farmlands—had suffered the same fate. Hardworking farmhands were suddenly aplenty, and surviving farms had more inquiries for work than they could accommodate. Many were sent away from the cities as well, as urban areas were already inundated with the homeless and unemployed, such as those huddled in Hoovervilles. Some Dust Bowl migrants suffered from dust pneumonia, an inflammation of the lungs’ alveoli (Latin alveolus, “little cavity”: small, tree-like structures with a hollow cavity, central to the body’s absorption of oxygen), as a result of one’s lungs being filled with dust. Once enough dust has settled within the lungs, the accumulation of foreign substance glues or muddies up the lungs’ capability to expel (or clear out) the substance, and the sickness becomes irreversible. In these more extreme cases, death was imminent. Others suffered from malnutrition, as food was a scarce commodity. And yet, the roads were not traveled upon solely by displaced farming families. Lawyers, professors, small business owners, and lay workers of every variety were all just as willing to put their shoulders to the plow for a hot meal or a nickel, some of whom had dapper clothing still in their suitcases from their romps at the jazz clubs a few years prior, should they meet someone who valued appearance at a hire. The shattering one-two punch upon the economy afflicted both the rural and urban areas. Those who lived in comfy homes and whose businesses were still surviving were met with frequent interruption in their daily duties by men who promised they were the best and most honest workers available. Competition was everywhere. From potatoes to cotton to lemons to oranges to peas to berries and so many others, the automobiles clunked and sputtered from field to field producing people of all ages willing to pick anything, to plow anything, to till anything, to do the dirtiest of jobs for the smallest pay, and when the harvest was complete, the engines crackled to life once more as the entourage moved on to the next agricultural shrine. Between stops, anything found on the side of the road was a treasure worth pulling over to collect. A sunburnt potted plant that had fallen from someone else’s wares wagon could be nursed back to health and sold for a penny at the next town, providing the traveler had a green thumb and extra water. A box of plates that had fallen and shattered into thousands of pieces was a beautiful mosaic just waiting to be canvassed. A random sheet of metal was a new roof at the next shack. An old board could hold anything together. There was a use for everything, and nothing went to waste. With enough creativity, a penny or nickel could be earned with every piece of abandoned trash; with enough resourcefulness, any material item could be turned into a mobile home reparation. At times, familiar faces were spotted as the migrants frequented the fields, and people chose to travel together from harvest to harvest, creating a kind of spontaneous mobile community. After a hard day’s work, it wasn’t uncommon that the migrants would gather under the shade of someone’s makeshift shelter and sing songs, dance, tell stories, and give updates about nearby work opportunities, despite the fact that there was an ever-present race to arrive at the next assignment while there were still plants to pick from. The sudden, national eviction of people from all backgrounds did many times cause strife, as men and women were forced to keep peace within social circles they would have never mingled with before. However, the sudden, national eviction of people from all backgrounds was the very thing that gave them everything in common now, as they were all in this game of survival together. Who they once were and what they once did stopped mattering when one among them started to cough or lose another pound. Many have stood behind books, movies, and television depictions of this phenomenon, continuing to flatter and perpetuate a notion that the Dust Bowl migration was a time when Americans were falling like flies, starving to death in broken-down automobiles on the side of the road, and falling to their knees in tearful begging for even the smallest crust of bread to bring back to their bus load of barefoot children…and although there is truth to that depiction on a case-by-case basis, it’s not fair to consider that a complete representation of all who were affected during this era. A large number of families did, in fact, survive the Dirty Thirties with hopefulness and faith in the Christian God, relying on prayer, growing close to one another, and eventually crawling out of horrific debt with all their children still alive and fed. And for just as many heartbreaking memories and statistics that can be listed about the Great Depression and the Dust Bowl, a list of incredible developments counteracts. Not only did these difficult times draw people closer to God, family, and others, lifestyle ethics were established for generations to come who did not fear hard and laborious work, did not waste even the smallest of material possessions, did not spend money recklessly, and did not take for granted the wisdom that needed to be applied toward decisions that altered the government and its leaders and laws. Like many whose parents and grandparents survived the Great Depression and the Dust Bowl, I grew up a living witness to the “hoarding” habits mentioned above, which my elders held for items of possible value. My grandparents, the McLaughlins, built a trailer park that became a lodging area of small cabins and later small houses with the scrap boards and materials they found and “hoarded” together with some purchased products that they then covered with plaster. They owned and operated that property until El Mirage, Arizona (which, ironically, they helped establish in the early 1940s), forced them (using eminent domain) to surrender to the city. It was on that location where I spent countless hours as a young man, and later as a young preacher, sitting with Grandma in their simple home or with Grandpa outside by the wood pile. I was listening and learning, absorbing a deep philosophy of life that had been honed in the fires of the deepest and longest-lasting economic downturn in the history of the Western industrialized world, itself followed by another World War which also refined and defined everything they believed and practiced. Their stories and life-lessons were absorbed into my impressionable young soul regarding endurance, independence, honesty, hard work, faith, thankfulness, and kind-heartedness (I cannot recall the dozens of times my parents and grandparents refused to charge poor people who sought shelter on their property or meals they gave them to make sure they did not go hungry) that became the bedrock of my philosophical worldview. Elsewhere in this book you will read how the Second World War was won by these resilient individuals whom famed television journalist and author Tom Brokaw once called “The Greatest Generation.” Not only did they unify the American clarity of purpose during international conflict (World Wars I and II) but reaffirmed for the next generation and the world what famous nineteenth-century French statesman, historian and social philosopher Alexis de Tocqueville concluded—that “America is great because America is good” (albeit, de Tocqueville also warned, “If America ever ceases to be good, America will cease to be great”—a sober warning for us today). It was there, while Grandpa McLaughlin whittled on a piece of tree limb (what time he wasn’t challenging his rooster to a fight! ), that I’d ask the deepest questions about life, meaning, God, the world, humanity’s place in it, the afterlife, and make other inquiries, including those about survival. He and Grandma, with my mom, uncle, and cousins, had fled the Oklahoma farm after the rains refused to come year after year, leaving their dead crops behind. It was hard for them to do that, to walk away from the homestead that my Great Grandfather Kendall (Grandma’s maiden name) had built and then left to them. Grandpa Kendall had been the mayor of Buffalo, Oklahoma (established before statehood), and a successful businessman. He had built a beautiful home on seven hundred acres, which for many years was the gathering place for Northwest Oklahomans to travel to by horse and buggy to cast their votes in state and national elections. Grandma McLaughlin as a child had been pampered by these parents, the Kendalls, and had gone to expensive boarding schools. Grandpa McLaughlin, on the other hand, was a scrappy third-grade dropout, seventeen years her senior (not unusual or “weird” in those days) whom she fell for. Years later, with her high-society clothing and porcelain dolls a distant memory, she, alongside Grandpa and the family, set out to become the rugged individuals and “new pioneers” they would develop into. Short on cash and necessarily high in faith, they became the perfect role models for me and my generation to learn from concerning the things in life that should really matter and be cherished. My grandparents have been gone now for many years, and with them, most of the Greatest Generation. And when by contrast I consider what people value today, I worry. We now live at a time when far too many Americans have no idea where our greatness as a nation came from. People feel “entitled” to what they have not earned and, according to polls, they have an increasing desire for a socialist lifestyle that believes others who have worked hard to succeed and do better owe them a way of life, including free higher education, free universal healthcare, housing assistance, and so on. As this book heads to the printer, we are in the most amazing (and scary) political season in which an astonishing number of citizens actually prefer a turn from free market capitalism (which built the most powerful, progressive, and giving society in history) toward the enslavement of pseudo-socialism and “cooperation over the competitiveness of a free market economy” in which “all people in society contribute to the production of goods and services and that those goods should be shared equally.”[v] This stands at diametric opposition to the capitalist system our forefathers died to protect in which individual efforts are rewarded and trump the collective (i.e., the New Testament model in which if you won’t work, you don’t eat) wherein the free market determines the distribution of goods. Derek Gilbert has much to say about this later in this book, but suffice it to say, “things, they are a changing,” and not in a good way. The irony is that socialism—while promising a shared level ground—lowers the living standard for all while providing little legal method for prosperity of the individual, while American capitalism historically has resulted in the abundance of capital that has fed the hungry of the world and has built the hospitals and care facilities that to this day assist the needy. This is one reason I believe America needs an awakening—first, a spiritual revival; and second, a cultural awakening defined by the reestablishment of Greatest Generation principles and behaviors that could positively strengthen, recharacterize and rejuvenate our society. Donald Trump, as inarticulate as he is, has captured the essence of this longing with his political jargon: “We can be great again” and “We can win again.” Is the Donald right? I’d like to believe on those points he is. I’d like to think that America can once more be a nation of winners, of rugged individualism and pioneering determination. I pray that the book you now hold in your hands is a first small step in this direction and a reminder for many of what once made us the envy of the world. I choose to believe all is not lost, that our nation can once again honor and commit to God, glory, and greatness. 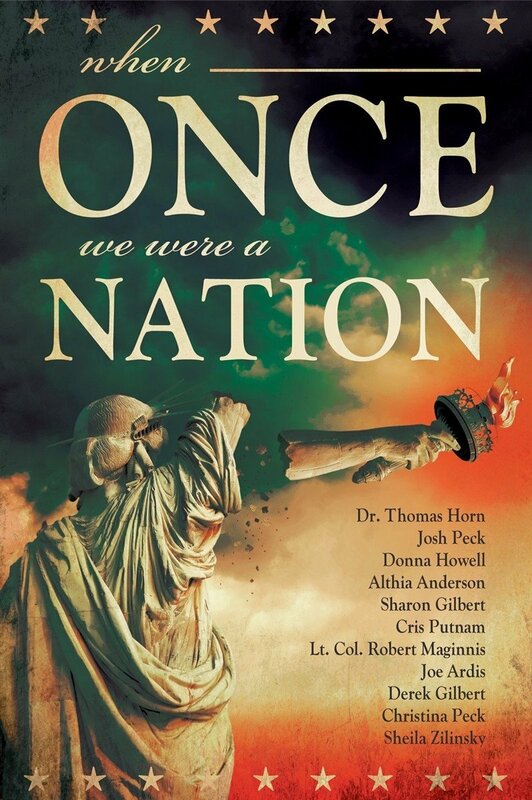 EXCERPTED FROM “WHEN ONCE WE WERE A NATION — GET YOUR COPY HERE! [ii] Jennifer Latson, “The Worst Stock Tip in History,” TIME, September 3, 2014, last accessed April 19, 2016, http://time.com/3207128/stock-market-high-1929/. [iii] “Herbert Hoover,” The White House, last accessed April 19, 2016, https://www.whitehouse.gov/1600/presidents/herberthoover. [iv] “Hoovervilles,” History, last accessed April 20, http://www.history.com/topics/hoovervilles.